The work of Street Angels is to feature on BBC 1's popular Songs of Praise programme on Sunday 19 January at 3.55pm. The programme features a sequence where Diane Louise Jordan (below) joins the Bedford Street Angels on a busy Saturday night and finds out first hand how the Street Angels play a vital role in keeping people safe. In a moving interview with Frederick and Fran Gill, she learns how the tragic murder of their son Robert acted as a catalyst to the formation of Bedford Street Angels. Since its launch in 2005 Street Angels has expanded to 125 communities across the UK and launched in Majorca, Spain last year. 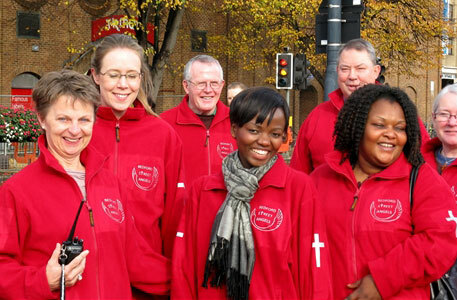 The initiative received the Big Society Award in 2012 and has contributed to a reduction in violent crime and anti-social behaviour in many of the communities where Street Angels operate. The scheme has become a catalyst for other ideas such as Club Angels, Youth Angels and Festival Angels.